Like West Side Story and its original inspiration, Puccini’s La Bohème, Rent doesn’t date. Despite its specificity – 1996, East Village, New York, the aspirations of the characters, and the persisting stigma and threat of the scourge of AIDS – audiences respond as if the story were yesterday. The depiction of LGBTQI characters is more ‘acceptable’ to the mainstream, but AIDS isn’t ‘over’, and the show’s themes are as contemporary as ever: loyalty, friendship, the search for and risks of love, loss, death and dying, the obstacles to identity and creativity in a hostile world. The opening night audience seemed to know what to expect – or what they wanted from the show - and they got it. This production’s cast is filled with talent – and that includes the so-called ‘ensemble’, each of them playing multiple roles. Nathan Fernandez is funny and lead material, Lucinda Ventimiglia is a great singer and comedienne, and Willow Sizer fulfils her several roles so well it takes a moment to see that each one of them is her. Jye Cannon, Isabella Ferrer and Nik Murillo have fewer chances to shine but they grab every one of them with both hands. Of the very solid lead cast, it must be said that the women – and we should include Marty Alix’s Angel here - rather outshine the men. Partly that’s due to the text: the female characters have more to do, more light and shade, more chances to dazzle and possibly better songs. 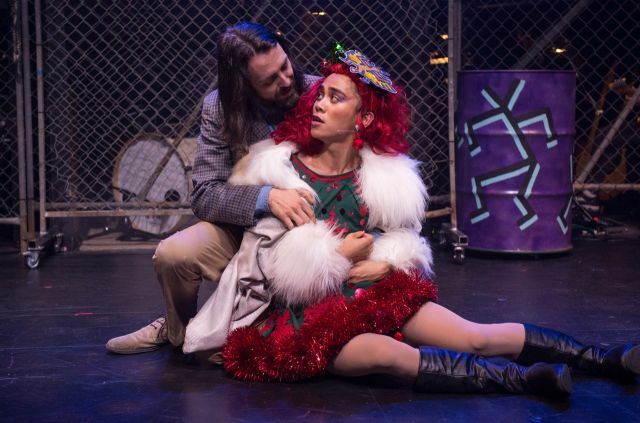 Mimi (Samantha Bruzzese) burns with charisma – startlingly attractive, forceful and with a blatant sexuality, all making her love for Roger (Connor Morel) all the more fierce and poignant. Zenya Carmellotti brings vitality to her lawyer Joanne; she brims with confidence and her smile makes us believe she could get away with anything. The standout, at least for me, is Kala Gare as Maureen. Tall, gawky but graceful, with the look of a young Rosalind Russell, her character arrives on stage some way in, but with maximum impact. Her deliberately ludicrous routine ‘Hey, Diddle Diddle’ – made even funnier by back-up ‘dancers’ Mr Fernandez and Ms Sizer trying to keep up – is a highlight. Filmmaker Mark (Evan Lever), one of the few characters not HIV Positive, is engaging, but Mark has to spend much of the show acting as Narrator - and he gets no love interest. Square-jawed Cameron Steens’ Benny is the landlord/villain and there’s not a lot he can do with that. Dave Barclay brings gravitas and humour to Collins, but the character’s arc is a two-beat thing – although Collins’ love for drag queen Angel (Marty Alix) is hugely touching. Mr Alix himself is pretty fabulous and he pours all of that into his role – suitably outrageous and in-your-face in drag, enfeebled and pitiful, dying in pyjamas. Connor Morel brings truthful emotion to the key character of Roger, but the character is so relentlessly morose, fearful and regretful, he only gets to lighten things in the great flirtatious duet ‘Light My Candle’ with Mimi in Act One. But he is heartbreaking with his beautiful, final song (the song it’s taken him the whole show to write) ‘Your Eyes’ to Mimi (mirroring Puccini at this point) as she supposedly lies dying. Director Mark Taylor and set designer Sarah Tulloch opt for the band onstage and a shallow playing space on two levels. The set is suggestive of the period and the milieu rather than cluttered with detail and flanked or screened by cyclone wire fences. Kim Bishop’s costumes must be the result of a sustained op-shop hunt and they fix the period precisely. Mr Taylor manoeuvres his big cast of fourteen – at times all on stage at once – in and out, across and up and down with great skill, never letting the pace flag. No mean feat when Rent has a lot of story; there are at least five plot strands, but we move smoothly from one to another without getting lost. Lighting transitions from Rachel Lee smooth these transitions. What a difference it makes simply to light another portion of the stage – café to loft to church to street, back to the loft - and roll on. Rent is rock opera, but there are still sneaky little references to Puccini and the influence of Sondheim sometimes breaks through. Musical Director Katie Weston gets a big sound out of her ten musicians, including herself (we note that one of the sponsors is LSS Productions, ‘specialists in Sound for Music Theatre’ and this has undoubtedly made a difference). However, although the entire cast is miked, the sound does get a little muddy at times in the Chapel off Chapel space and lyrics get lost – unfortunate when so much of the plot is carried by the forty-eight songs. Some cast fare better than others in this regard, but it does inhibit full engagement. Rent was a big hit in 1996 and went on to run for over five thousand performances. With this cast and the momentum given it by the energy of the direction and the music, you can see why. It has the themes, the characters and the emotions that make audiences disregard the plot holes, contrivances and cop-out ending. 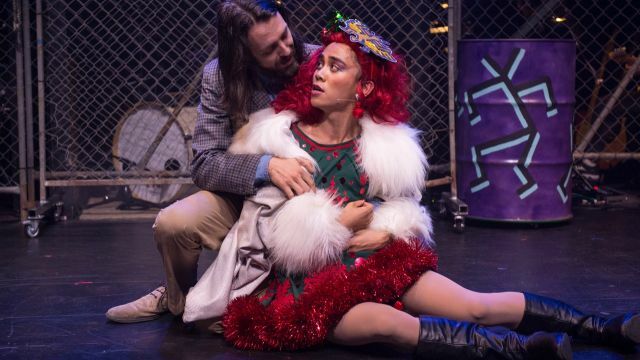 Producer James Terry has done splendidly to put together this great cast, great musicians, designer, lighting, sound and choreography (Freya List) to bring Rent back to life again in this fresh and pumping iteration.